Round 2 have been keen to jump into Discovery, considering kits of multiple ships at multiple scales. 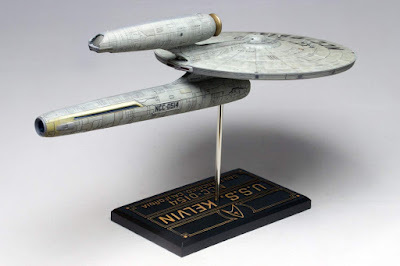 The first of those will be the USS Discovery itself, which will be offered first at 1:2500 scale, making it about twelve inches long. 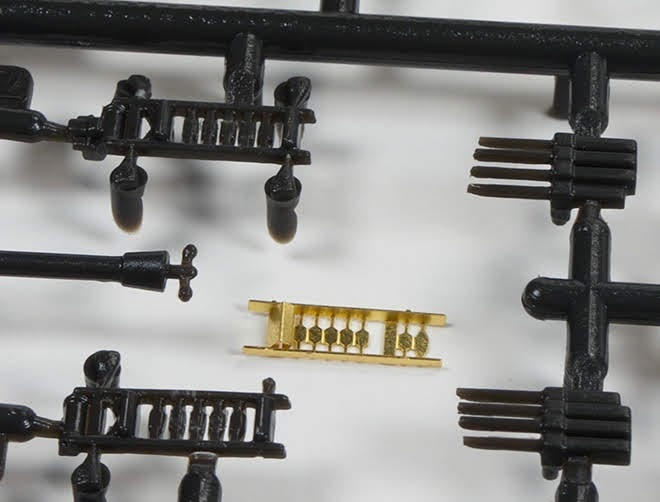 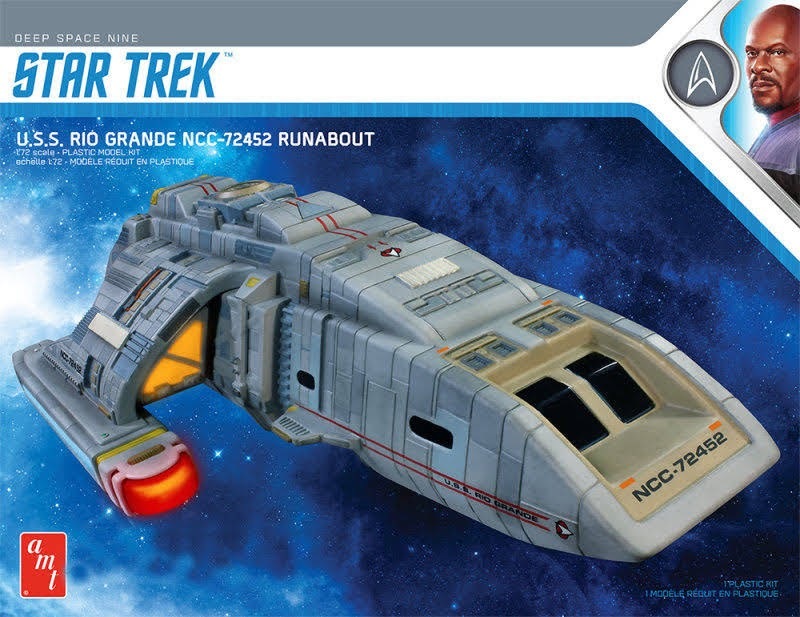 It's not yet known when this will be be arriving, but it shouldn't be too far away, as initial box art is now in the wild, and some specialists retailers, including HDA Modelworx, are starting to take pre-orders. A built version of this kit was previewed recently, in an Amazing Scale Modelers group chat with Round 2's Jamie Hood (thanks to Cult TV Man for pointing it out). 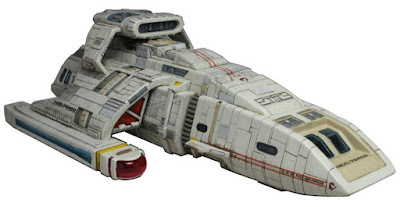 The kit looks rather shiney painted up, and also teased was a same scale USS Shenzhou kit which must be on the way soon too (see screencaps below). There is still talk of the Disco-Enterprise to follow, but maybe at a large scale, and indeed the Discovery might yet get scaled up too. In other news of forthcoming sets, initial box art has also been released for Round 2's reissues of the AMT 1:2500 scale USS Enterprise-D, and Polar Lights 1:1000 scale Enterprise NX-01, which according to HDA Modelworx are due in the first and second quarters of the year respectively. 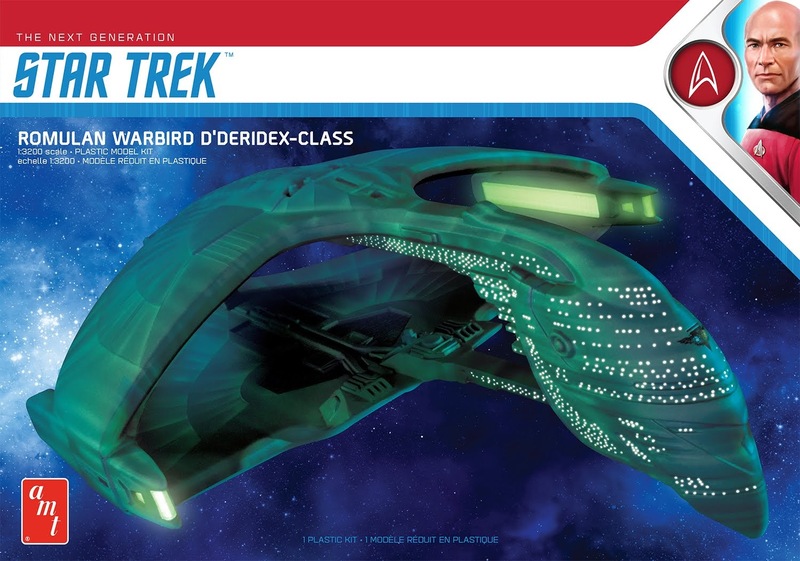 Just starting to arrive in stock this month is the 1:3200 scale AMT D'deridex class Romulan warbird kit, also a reissue, but like the above, featuring new box art. 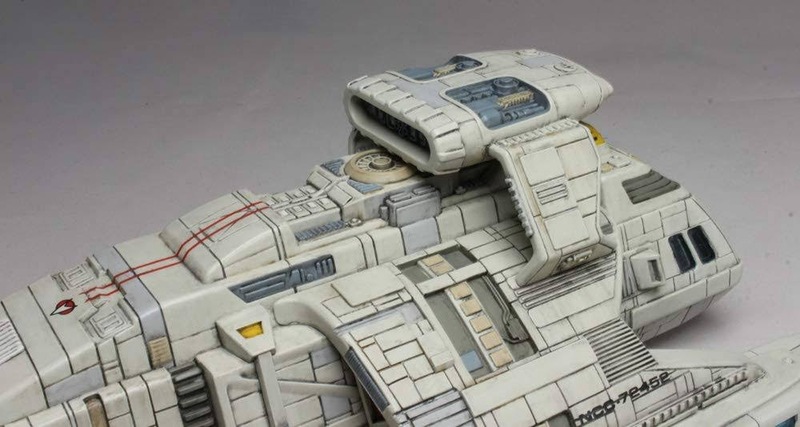 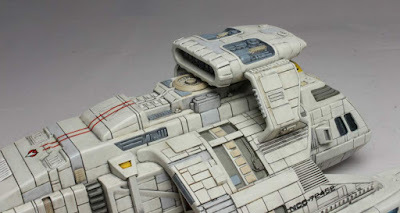 To keep track of all the latest model kits and other starship model releases, kit the "Models, Toys, and Games" tab on my 2019 schedule page. 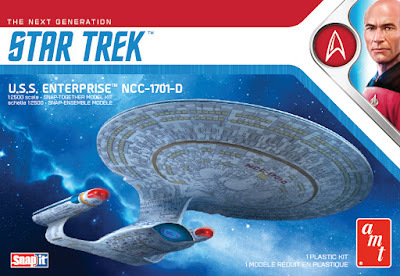 Looking at all this stuff, as much as I love the original designs and completely understand the continuity freak-outs, I also find the variety amazing that the new alternate/reimagined timelines bring us. I mean, the Kelvin ships are so close and yet so far from what we've been used to, which makes for the most irritating ships, but damn, they still look great as models. 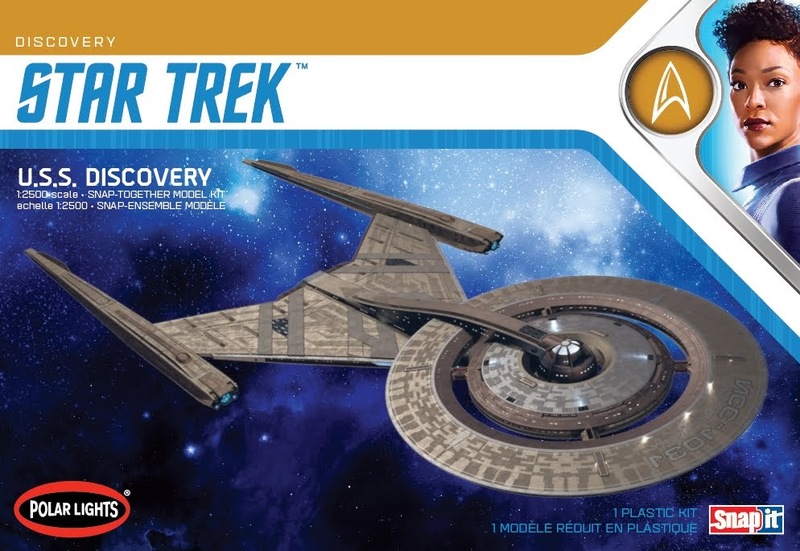 Discovery made the (wise?) choice to go completely overboard with the designs, which in itself resulted in some pretty amazing looking Starfleet spaceships, I think. 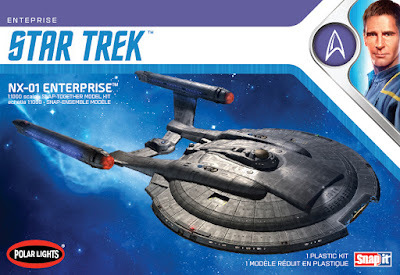 Different, yeah, but somehow fresh and cool (though I don't like the Klingons in DISCO, both ships and species design). 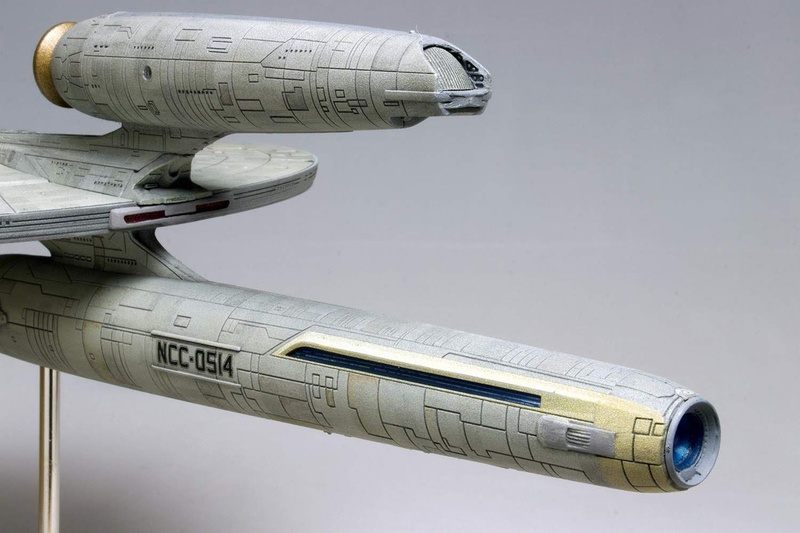 That said, I think it's interesting that DISCO managed to do such a great design for the classic Enterprise. 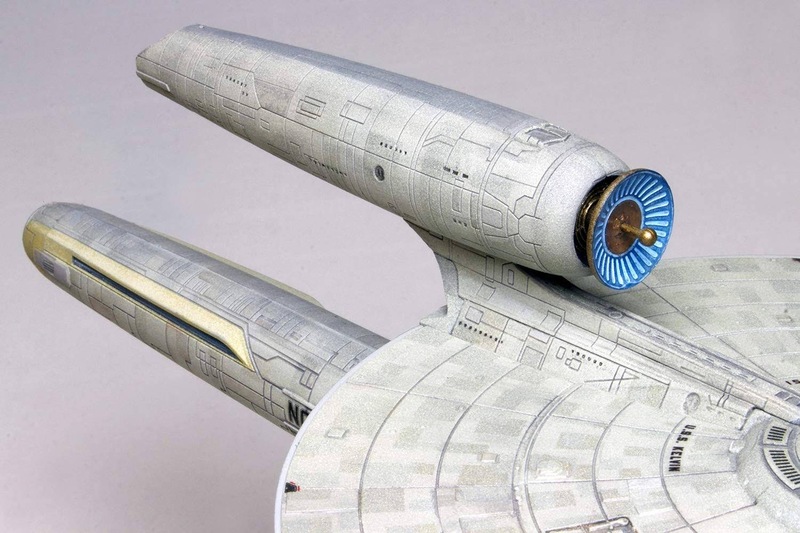 Subtle in some places, bold in others, but all within the original parameters, if you count Enterprise (the series) in. 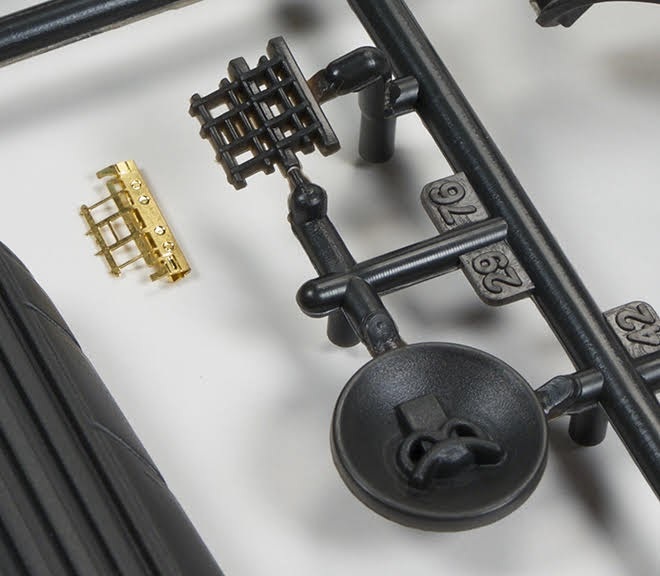 It's interesting to get so many different designs these days, opening up the path for other talents to come up with new ones. 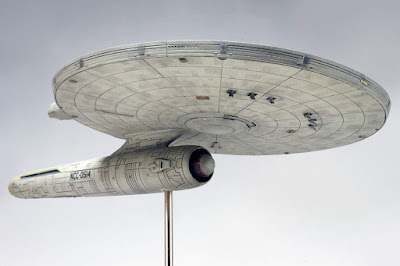 I think having all these bold new directions will make it a bit easier for fan artists to come up with their own designs and to be respected for them instead of getting their heads bashed in for not respecting canon enough. If that's the result of all the changes, it's certainly the best that's come out of it. 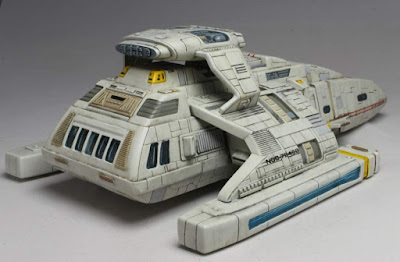 Ah, wish I was still in to models. 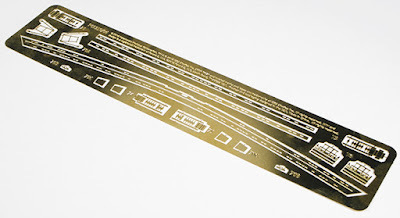 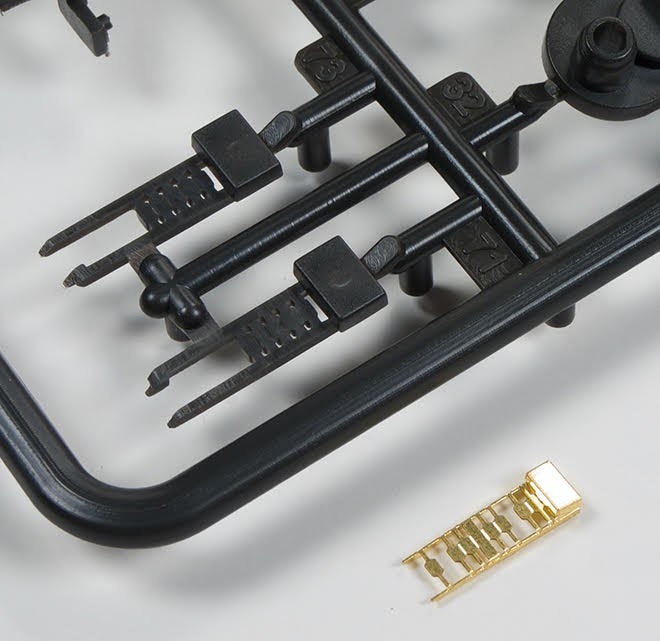 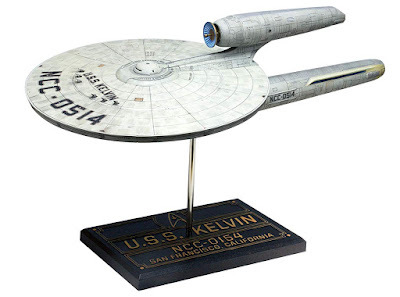 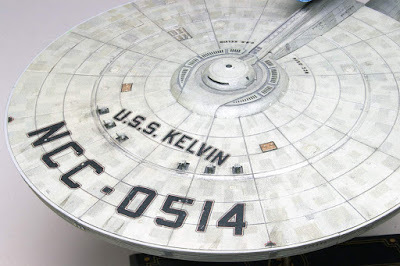 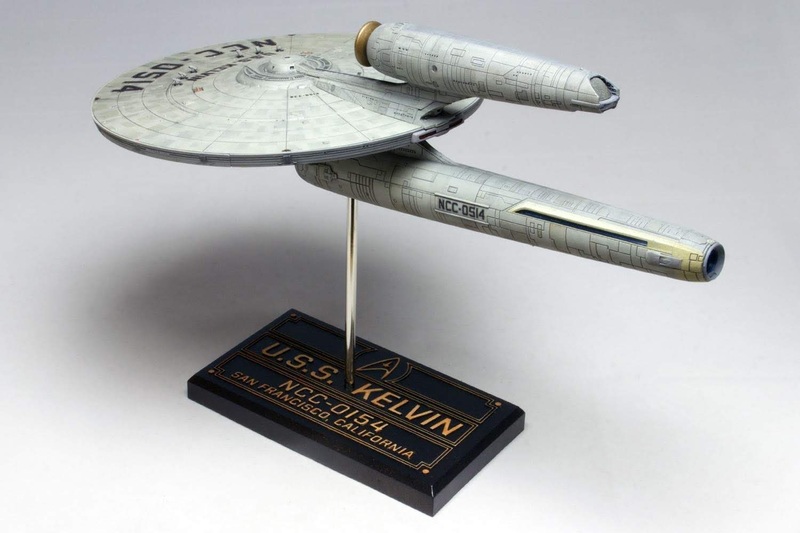 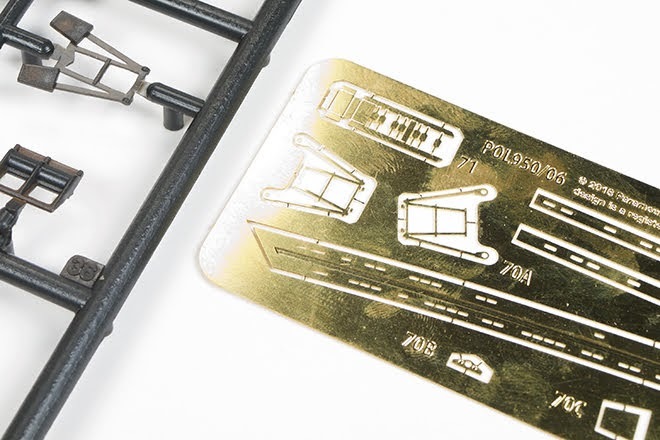 I hope the Kelvin's stand base isn't embossed, as the registry number is incorrect! NCC-0154?! 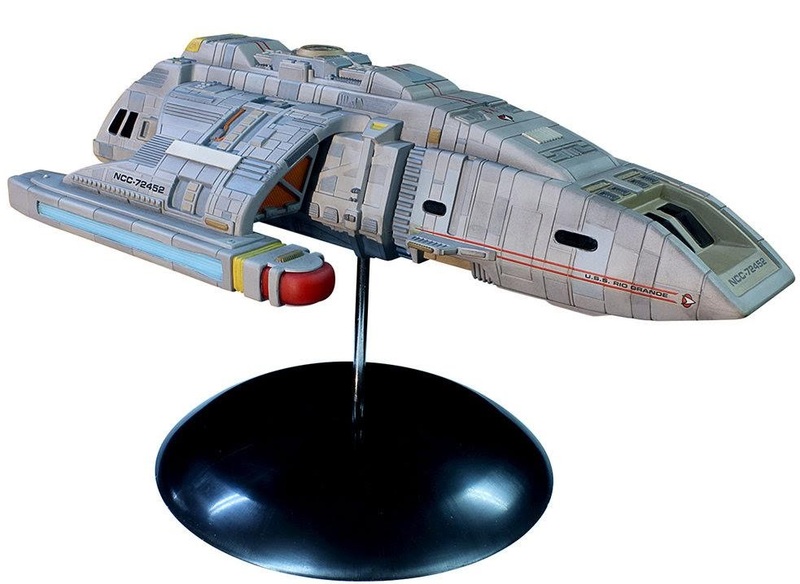 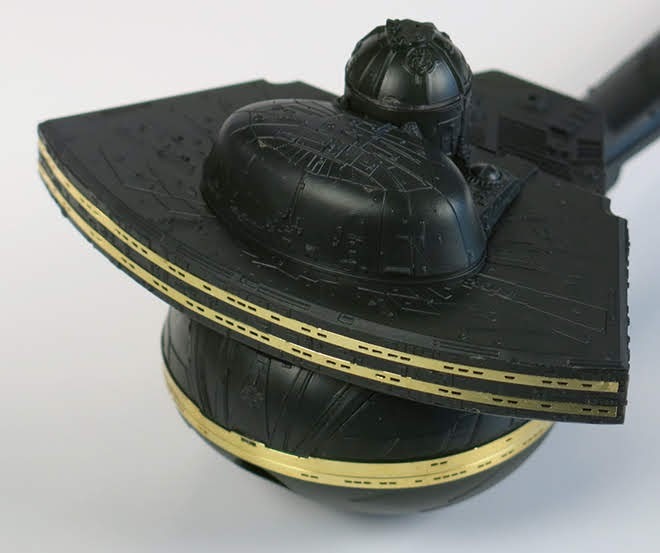 I currently have the eaglemoss refit an 2009 enterprise models along with the vengence an enterprise j just wished the j prise was bigger an showed more detail..